my bathroom is a semi-gloss benjamin moore fresh cut grass green with a leaf motif on the shower curtains, the toilet seat cover, and the bathroom rug. 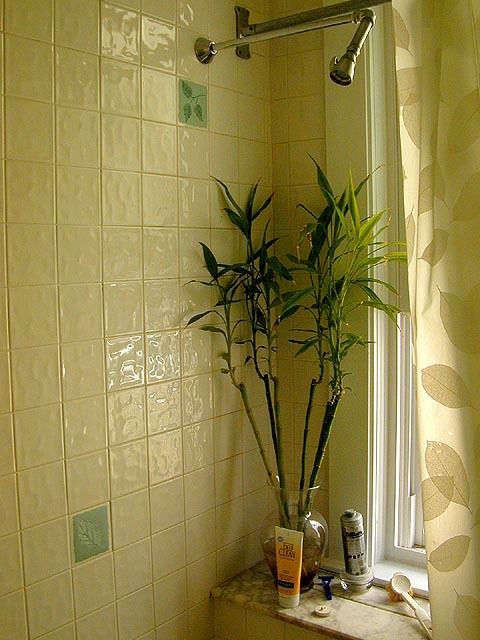 one thing that never seemed to fit are the several pieces of tiles that feature pink watercolored flowers. today i did something about them. my sister gave me these waterproof self-adhesive stickers that seem to be designed to stick on tiles, green squares with leaf patterns on them. i covered up the pink flowers, now the total immersion leaf effect is complete! i felt very martha stewart. while i was at it, i also cleaned the bathroom, tilex clorox the works. i have place line of thinking that if i can keep the bathroom clean, the rest of the house will match it in cleaniness, since bathrooms are usually the dirtiest part of the house. i finally decided to return the large bag of cans i've been hoarding, starting to get to the point where i'm running out of space to put them. i crossed into somerville, to the redemption center, and started putting cans into cardboard trays. there was a hispanic couple feverishly unloading cans and bottles as well from two shopping carts filled with recycleables. outside, empty shopping carts sit abandoned, while inside there was the strong odor of skunked beer. after i had everything out on the counter, a man came buy, did a quick count, then came back with my money, $4.10. with my newfound wealth, i went to star market to buy some ingredients for tonight's dinner with renata. when i got back i decided to do some biking down the minuteman bike trail. today's weather was the coldest of the past few days, but it was still in the 60's, warm enough to wear shorts. i strapped the gps (HENCEFORTH KNOWN AS THE DEVICE THAT SAVES LIVES) to the handlebar of the bike so i could track myself and see how far and how fast i've been riding. the trail was practically empty, just a handful of people. i bumped into liz perlman at alewife, biking her way into cambridge from lexington. liz, fellow tufts alumnus and former roommate of manny's, we ended up talking about manny's wedding next month. further into the trail i caught glimpses of high school fields with students engaging in spring sports like lacrosse or soft ball (there were shades of bend it like beckham moments). scenery wise, there wasn't very much else to see. some common birds, squirrels scurrying across the path here and there, and a rabbit, which blended seamlessly into the background, and i was only able to see it again when it moved away. i went as far as lexington center, where i stopped to get a blue gatorade and some toothpaste from cvs, then i rode back. along the way, other bikers were passing me, none of them were just out for a leisurely ride. i thought i was peddling pretty fast (fast enough to feel the muscles in my thighs straining), but they smoked me like i was on a baby's tricycle. after 14 miles of biking, i made it back to my part of cambridge. i'm a bad biker by the way (of bicycles that is). i don't wear a helmet (not after i left it over at julie's, but even if i had it, i wouldn't wear it), i ride on the sidewalks, i ride down one-way streets the wrong way, i disobey traffic lights, i don't call it when i pass someone, i don't have night lights, and i definitely don't use hand signals, EVER. thing is, nobody's ever taught me how to ride well or safe, so my riding style is a very pedestrian style, anything goes make up my own rules along the way. if i was on a motorcycle though, that's a different story. but bicycles, that's such a grey area. i started to make dinner before renata arrived. i'd narrowed the choices down to three: beef barley soup, beef tortellini soup, or stuffed zucchini boats. the zucchini boats were the most intriguing, essentially made like a french bread pizza but using hollowed out halves of zucchinis instead of bread. unfortunately, the zucchinis at star market were too small to make a meal out of, so i opted for the remaining two choices. i've never made beef tortellini soup before, but the barley soup seemed heartier, and i've made it before (using rice, a complete disaster), so i know how to avoid the pitfalls this second time around. i was going to crockpot the whole thing, throwing in a can of whole tomatoes, few cups of beef broth (actually one beef, one chicken, i got the wrong can), pearl barley, chopped garlic, chopped peeled carrots, a can of mushrooms, a jar of pearl onions, sugar, bay leaf, thyme, pepper, and last but not least, chopped beef. the crockpot was actually taking too long, even after i cranked it up on high, so i switched tactics midway through and went with the medium-low stovetop simmering for an hour. i also took the opportunity to use my pound cake mix and put a loaf in the oven, baking time one hour as well. renata came close to 8pm, right when i was about to finish cooking. she brought with her two ears of corn and a wedge of watermelon. tonight was her last class and she was feeling that post-class euphoria. she loved the soup, but here's what i thought was wrong with it: i don't think the ingredients fused together as well i would like them to be. it's hard to describe, but when i get a recipe just right, the ingredients fit together perfectly. there was something about the soup, it was missing some pizzazz, something to bring everything together. maybe it needs more stewing time? maybe some more spices? however, it was definitely barley soup, a vast improvement over my first attempt. i also made some fruit elixirs, forgoing yogurt, nothing but frozen fruits and juice. after dinner, i showed renata some neat things about the chinese language, pulling dictionaries from the shelves. with little stamina left after a late evening last night, renata went home, but not before we tried some of the pound cake. not exactly sara lee, but i like the thicker crust. renata laughed as i struggled to free the cake from the loaf tray. later, after work, my father dropped by briefly to deliver a long coffee table that'd been sitting in the basement of the cafe. an antique affair, with a removeable glass countertop, it seems to fit in well with the couch (about the same height off the floor, good for putting your feet on), plus it's free, so i can't complain.